Hey friends! I originally published this recipe in 2008, my first year of blogging! I’ve recently updated the photos on this old family favorite and hope you get to enjoy the cookies for yourself soon! These cookies float away somehow, or magically disappear into another dimension when you aren’t looking. Although I make every manner of cookie throughout the year, these always feel extra special to me. 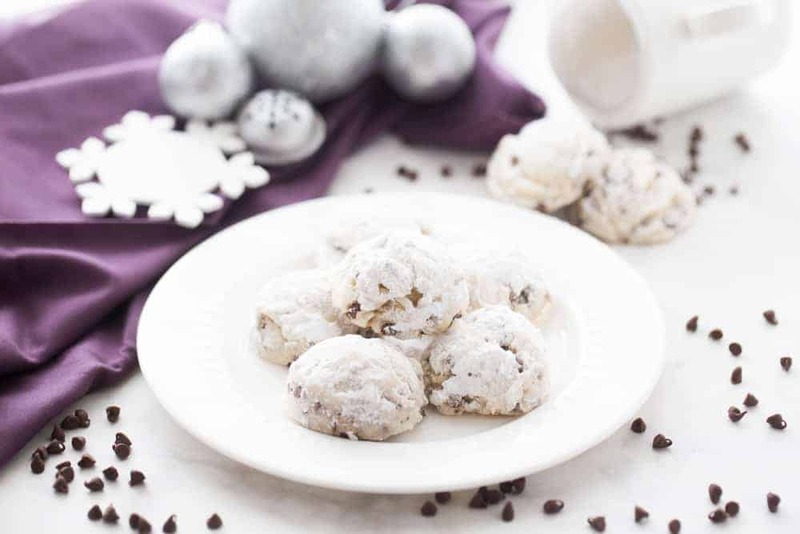 Part of that is because of so many childhood memories attached to them, but another part is the tender lightness of the cookie, tiny unexpected pockets of chocolate, and angelic coating of confectioner’s sugar. I guess they taste magical because they really are. 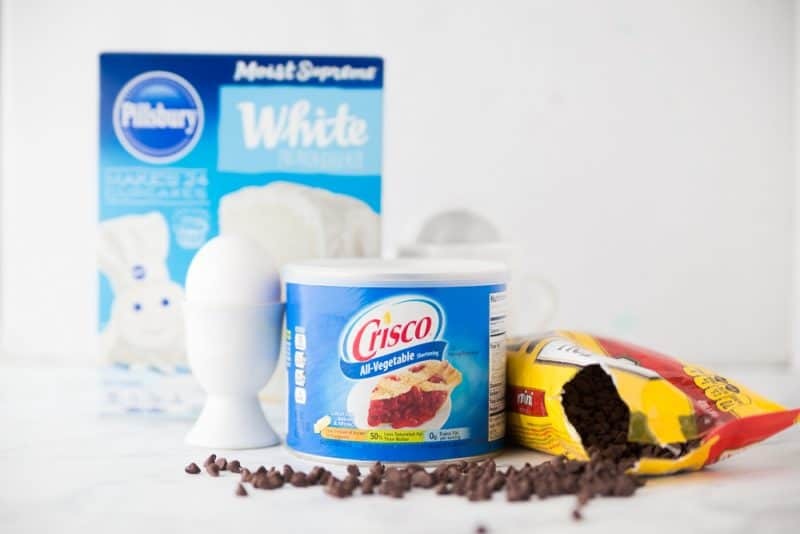 You’ll need: Vanilla, vegetable shortening, mini chocolate chips, one egg, confectioner’s sugar, and white cake mix. Yeah, I just said cake mix. Trust me on this, cake mix has found a higher calling in these cookies! If you don’t have mini chips, you can just chop up regular ones a bit. I’ve done that plenty of times. Place shortening, water, vanilla, and egg white in a large mixing bowl and beat with an electric mixer for about a minute. After you mix those its going to look a little globby. I tell ya, I’m sweeping the world with my culinary vocabulary. Add in cake mix and beat with an electric mixer until well blended, about two minutes. Add in chocolate chips and nuts, if using. Mix again until just blended. Now we’re done with the dough, wasn’t that easy peasy? 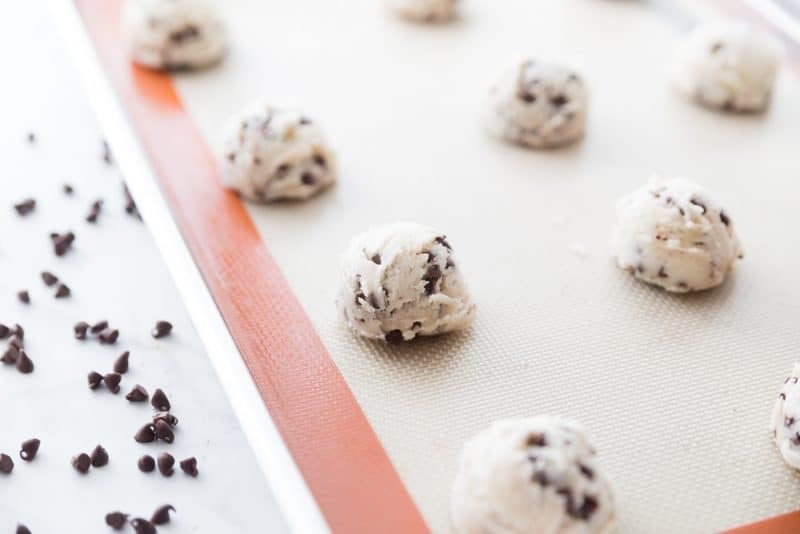 Roll dough into one inch-ish balls with your hands or use a cookie dough scoop. Place about two inches apart on ungreased cookie sheets. Bake until almost set, about ten minutes. Like this. You aren’t going for browned here, just almost done looking. 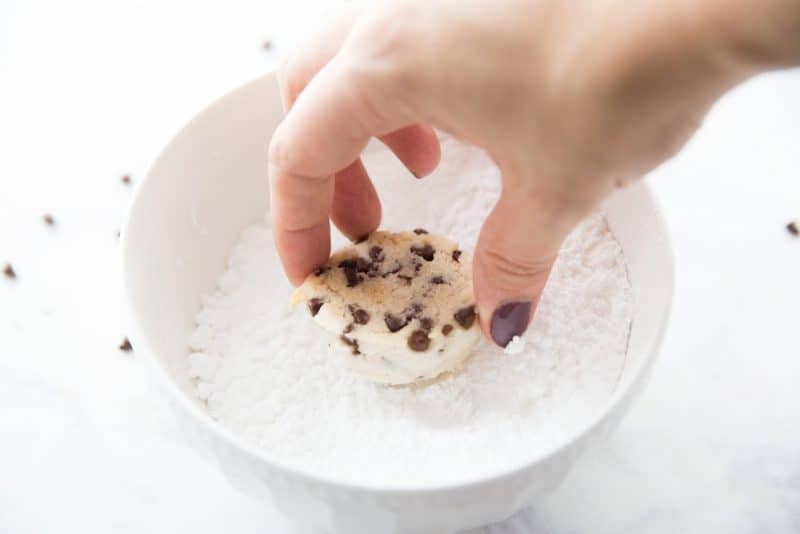 Remove from pan while hot and dip tops in confectioner’s sugar. If they are too soft you can set them aside for a minute or two but you need to dip them while they are warm. Dip only the tops, like this. The confectioner’s sugar will stick to them as long as they are warm. Look at gorgeous these are? They would be SO pretty on your cookie trays this Christmas. Hopefully you won’t run into the same problem I usually do, though. Whenever I make them for a party or event, there are never enough left to take when it comes time to leave! In a large mixing bowl, place shortening, water, vanilla, and egg white. Beat with an electric mixer at medium speed for about a minute. Add cake mix. Beat again with mixer until smooth and no lumps remain, about two minutes. Add in nuts (if using) and chocolate chips. Mix once more just until incorporated. Shape dough into one inch balls. Place about two inches apart on ungreased cookie sheet. Bake until almost set, about ten minutes. While warm dip tops in powdered sugar, cool. Courage is fear that has said it’s prayers. Don’t hide from fear…make fear hide from faith! ~Submitted by Dianne Smith. Submit your quotes here. Click here to add this recipe to your Pinterest boards! Those look so tasty! I love cookies of all types, and these just look so light and melt-in-you-mouth-y! Yum! Stephanie, you hit it on the head, they just dissolve….they are horrible, I tell ya, horrible! I could eat myself sick on these and never look back! hehe Hope y’all are having a great day! YUM!! Another must try! Christy, don’t you know I’m trying to lose this baby weight, lol! I’m never gonna lose it with all these good recipes. I love food waaaay toomuch! My mom makes these and calls ’em sand tarts. She puts pecans in them. Never had them with chocolate chips before! Sounds like it could be good! 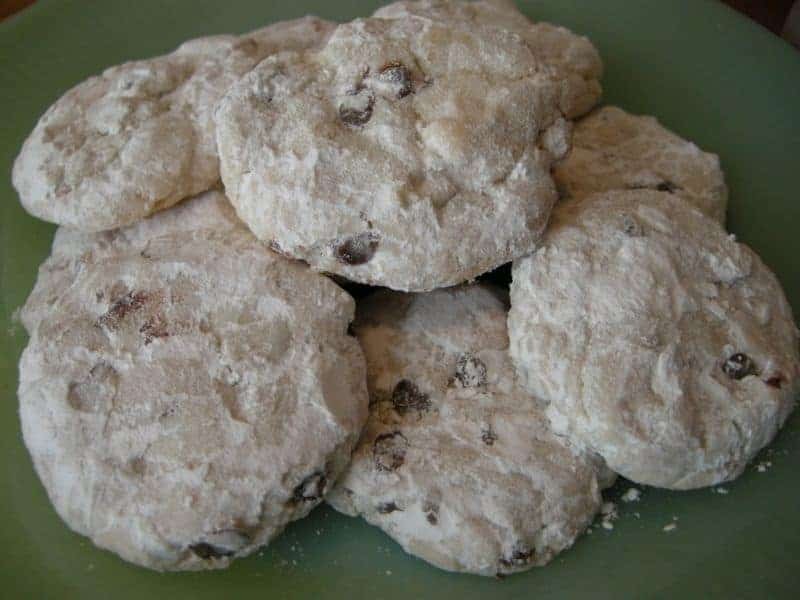 Yummy these would be a great addition to all the holiday cookies. I will add these to my list for my Christmas gift baskets. Arent cake mixes so wonderful and versatile, I am cake mix junky. Russian tea cakes appeared in Russia in the 18th century, literally as a confection used in a tea-sharing ceremony. By the 20th century, they were a part of wedding and Christmas traditions in the U.S., by their popular “Russian tea” nomenclature. The term “Mexican wedding cake” seems to have emerged in the U.S. in the 1950s, possibly a result of strained relations with the Soviet Union. 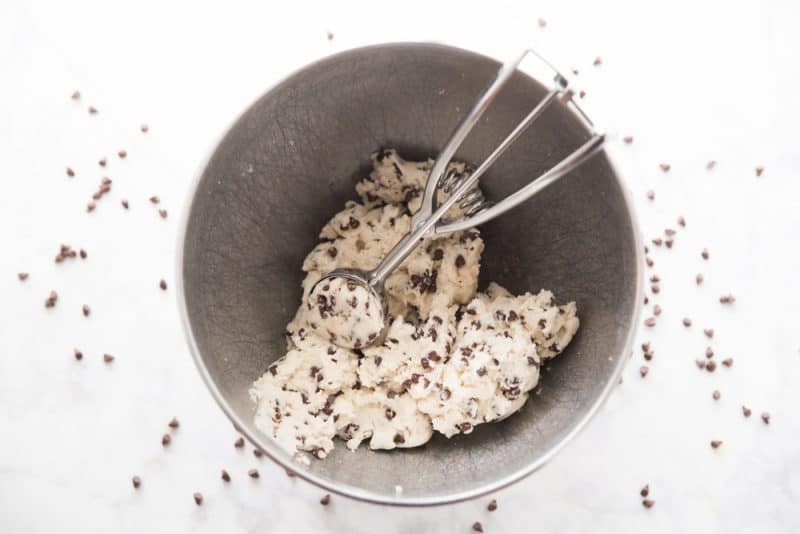 It sounds like the usual version is with nuts, but chocolate chips sounds just great too! The cake mix is a new twist to me! I know it must be good because everything with cake mix is so good with the possible exception of actual cake. These look divine. Oh these look yummy! I’ll have to try them! My family LOVES these cookies. They are the best. I voted for you on Divine Caroline. Sure hope you win. I’ve never tried this using a box cake mix or chocolate chips before. I’ve only made it from “scratch” per sea and nuts. 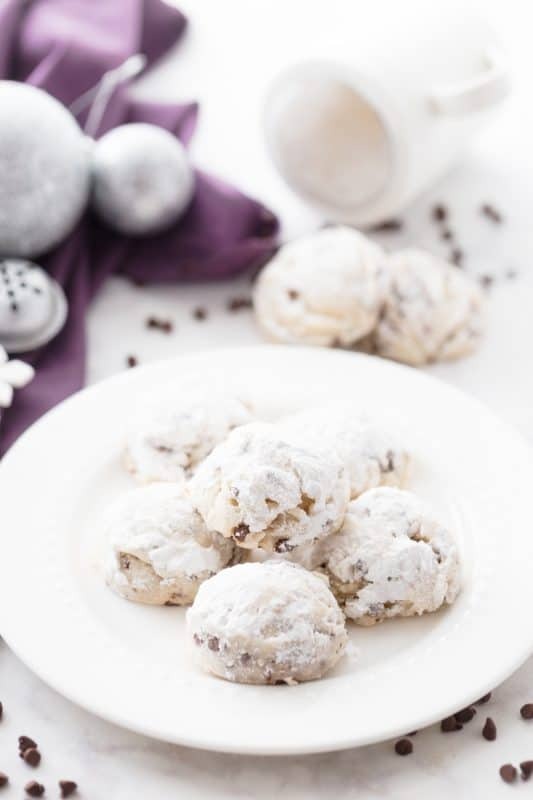 Hmmm….I love my regular version but I love chocolate chips so this just might have to be on my Christmas cookie plate this year. Thanks for sharing it. Those are just screaming my name which isn’t a good idea since I so don’t need them! I made these today! They turned out great and I gave you a little shout out over at my place..go check it out. You have had me in the kitchen so much my family has fallen head over heels for you! These are great! My kids love them. My mom used to make them and called them Roly Polys. These look amazing! I think I will make them without the nuts! 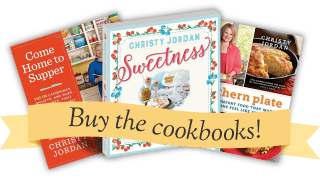 Can’t wait to see more cookie recipes! 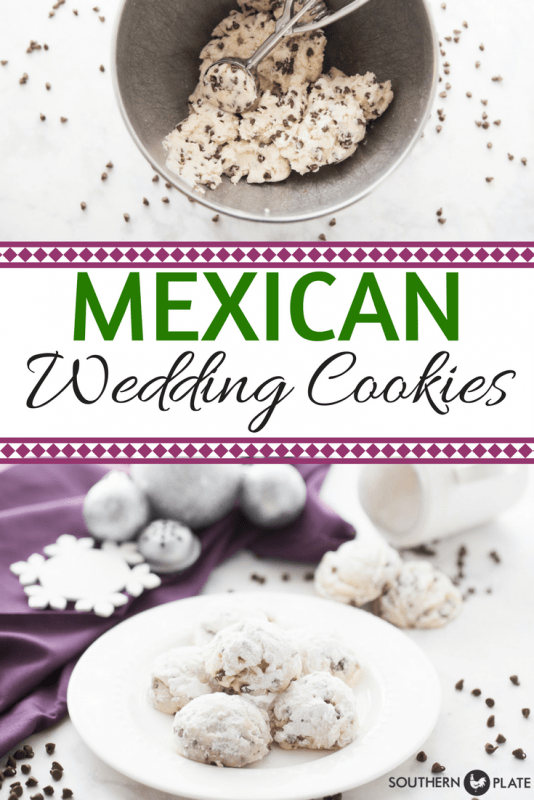 I love Mexican Wedding Cookies. I made them last year for my Christmas tins. So good! How much vanilla should you use? It’s not listed in the cookbook either. Thanks. Y’all are going to die when I tell you this! The recipe doesn’t actually call for vanilla. However, I am so used to adding vanilla when I make cookies that I just got it and put it in the pic. Then, as I was making it according to the recipe, I saw there was no vanilla, but as I had photographed, it, I put it in anyway and figured, oh well, in for a penny, in for a pound! However, I typed the recipe from the cookbook at the bottom and forgot to put it in there! I used about a teaspoon, but you honestly don’t have to! I was just being scatterbrained that day and covering my tracks…didn’t do too good a job, did I? I am an absolute fiend for Danish Wedding cookies so this is the find of the day for me! Thanks! Christy I just made these and they are FABULOUS!!!! Christy, the kids and I made these cookies last night and they never even made it to daybreak! lol yummy! Will definitely make these for the Christmas tins! They turned out wonderful! Thanks for sharing! I am so glad I found your website! I made these cookies for the first time last night and they are scrumptious! I wanted to try the recipe out before my office’s cookie exchange this week. I can see I’m going to have to make a bunch to make sure my husband and I don’t eat them all before the party. These cookies are positively addictive. Thanks for sharing this recipe! KUDOS! 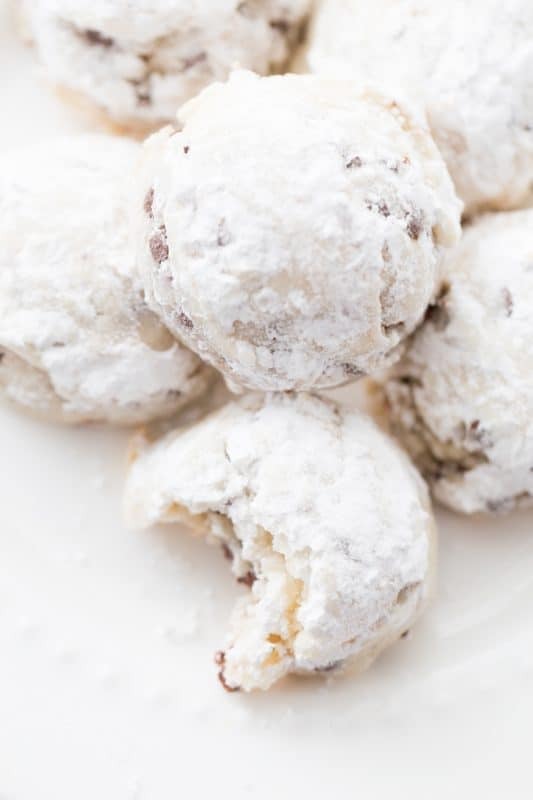 I will be making these for a holdiay party this saturday…however, you do not list how much vanilla to use. Please post in your nice recipe how much vanilla to use. Thank you! This is my most fav. cookie in the whole world. And now I can make it, Thank you! My husband is going to be so happy I found this recipe. You will be saving me a bundle on those expensive pink boxes! Thank you so much for posting this. Oh man, I love these things! Thanks for sharing! Danish Wedding Cookies were always my favorite, too! So glad to have a recipe to make them myself! Thanks, Christy!